A lot of people make New Year's resolutions. I try not to do that since I never keep them anyway. Instead, I make goals. Of course, I only manage to achieve one or two of them. Most, like finishing Tropico 4, get tossed to the wayside. I tend to make too many goals and can never get to all of them. But I would like to dabble in a few things in 2015. I usually list my EVE goals in August, since that's when I started playing, but I have two additional ones that don't happen within the game. The first is also a blogging related goal. I want to do a little more to cover the CSM. Sure, the CSM is a topic that drives people away from the blog, so that just means I have to try to figure out a way to make the CSM more interesting to people. Impossible, right? Well, I can try. The second is working with the EVE Static Data Dump. I really need to expand my knowledge of SQL and playing around with the EVE universe data would make the task more enjoyable. One thing that EVE teaches is to always try to do more than one thing at once. I taught myself Visual Basic .NET when I made a fantasy baseball application. Not only did I win a league and finish second a couple of times, but knowledge of VB .NET came in handy at work and is partially responsible for the job I have today. Time to renew the tradition. I also have another blog goal. I ended my Digital Dozen column yesterday. For almost three years I knew what I would write about on Tuesdays. Now I have to fill the gap. I'm thinking of continuing the tradition of non-EVE specific content. I play other games than EVE. I think maybe writing about the issues I encounter in other games like Star Wars: The Old Republic could prove interesting. My hot button issues with that game right now are the cash shop and the credit cap. I could also write about general issues, like if Congress gets "creative" (aka stupid) with legislation concerning online gaming. If all else fails, I could write about the theory of why real money trading is bad in online games. I started to do that in 2014. I may finish the job in 2015. People seem to like when I write about RMT. I also have goals for other games. For instance, I'd like to play a couple of the games I've purchased throughout the years on Steam sales. I haven't played Kerbal Space Program in such a long time. I need to reacquaint myself with that game. I have to go through the list, but I really need to finish one of those games. Speaking of finishing games, I want to get a character to max level in Star Wars: The Old Republic. I managed the feat in vanilla WoW (level 60), EQ2 during The Shadow Odyssey (level 80), and Guild Wars 2 (level 80). I really enjoy the Imperial Agent class and want to see how the story ends. Currently, my Operative is level 25. I'm not sure I really want to buy the expansions to get to level 60, but I definitely want to finish the original content to level 50. Another game I'd like to make time for is The Secret World. I keep updating the game, but never log in. The game is interesting, although between the combat mechanics and the game not running correctly on my laptop, I gave the game up a couple of years ago. But I have a better computer now, so maybe I return in 2015. Another game I need to return to is Landmark. I dabbled with the game in the middle of 2014 and need to return now that SOE added PvE combat a couple of weeks ago. I'm not much of a builder, but Landmark is laying the foundation for EverQuest Next, and I'd really like to go back to Norrath. I tried going back to EQ2, but so much changed. I think Landmark can scratch my Norrath itch. So those are my goals for 2015. Too much? Probably. But if I can accomplish two or three, then I'll feel pretty good at this time next year. In the final post of this column, I look back on 2014 and the popularity of MMORPGs as played by the Xfire community. As Xfire switched its business model to focus on eSports, the time Xfire members spent playing the twelve most popular MMORPGs each week dropped by 41.4% from 29 December 2013 to 28 December 2014. While 2014 wasn't a great year for the genre, one fact became clear in 2014: Xfire is on its last legs, at least in its current format. However, while the platform slipped tremendously, the membership still provided a large enough sample of gamers to detect general trends in MMORPGs in 2014. One was that much ballyhooed games like Elder Scrolls Online and Wildstar failed to meet expectations while others like ArcheAge stumbled. Second, some older games showed some surprising strength, with three games on the list launching in 2004 or before. Finally, new IPs are just not gaining any traction in this market, so expect developers to pull out older IPs in order to attract financing. We witnessed that this year with the launch of Elite: Dangerous and the continued fundraising success of Star Citizen in the space-flight simulation genre. Expect to see more games like SOE's Landmark and EverQuest Next (Everquest) and crowd-funded games like Richard Garriot's Shroud of the Avatar (Ultima) and Mark Jacobs' Camelot Unchained (Dark Age of Camelot). Just like movies are turning to tried and true formats, expect to see a lot of the same going forward in the MMORPG genre. The ranking for the year was calculated by taking the Digital Dozen score for each week and taking the average. If a game was not among the top 12 games played for a week it received a score of 0. The average score is listed after the name of the game. Those looking for the normal weekly rankings for Sunday can find them at the bottom of the post. What can one say about the dominant game in the MMORPG genre that's new? WoW was the top ranked game for all of 2014. In fact, WoW reattained the number 1 rank on The Digital Dozen with the launch of Mists of Panderia 118 weeks ago and never let go. Amazingly enough, despite a year-long content drought, the game exceeded the 10 million subscriber mark again with the launch of the Warlords of Draenor expansion in November. Apparently, the only thing that could keep WoW from remaining on top of the genre for years to come is Blizzard itself. That won't happen, as Blizzard cancelled its planned next-gen MMORPG, Project Titan, and rolled the best parts into a planned new FPS game, Overwatch. After a solid 2013, GW2 showed signs of weakness in 2014, first falling to the #3 spot behind Wildstar for four weeks in June before fighting for the #2 spot with Star Wars: The Old Republic in October and then the past few weeks in December. While Guild Wars 2 is the second rank game for the year, GW2 finished the year 3rd on the final Digital Dozen list. The weakness seems reflected in the latest NCSoft financial statement released for the 3rd quarter, which showed that GW2's revenues fell by 8.5% over the quarter. While I predicted yesterday that GW2 would not receive an expansion in 2015, the Xfire numbers might indicate otherwise. Could NCSoft require an expansion due to lower profits? An interesting question to ponder for the coming year. The strength of the Star Wars IP was on display in 2014 as SW:TOR's Digital Dozen score did not drop as much as rival Guild Wars 2's did during the year. SW:TOR showed surprising strength, even managing to wrest the #2 spot away from GW2 when Bioware released new content like Galactic Starfighters and the Shadow of Revan expansion. But like GW2, SW:TOR showed financial weakness in the latest quarter. In November, EA identified SW:TOR as one of the games that had decreased in revenue in the second quarter of its 2015 financial year. Unlike ArenaNet, which has the option of creating expansions to grow revenues, Bioware is already running full out trying to earn money, even going so far as to charge players for the ability to hide their headgear. Yes, a new Star Wars movie is in the works, but with a scheduled December 2015 release, can the game make it another year to enjoy the bump in popularity a new film will bring? And if so, what state will the game find itself in? FFXIV is an unusual game in many respects. Square Enix concentrates on its Japanese player-base, which helps explain why the game launched with a subscription model instead of the free-to-play or buy-to-play models. FFXIV is also unique as the game is the only one on the list that has both PC and console gamers playing on the same servers with each other. Xfire only counts PC gamers, which means that FFXIV potentially is more popular than SW:TOR and possibly even Guild Wars 2. Square Enix released three major patches for the game in 2014, Through the Maelstrom, Defenders of Eorzea, and Dreams of Ice. With a loyal fan base for the Final Fantasy IP, if Square Enix can keep up that delivery schedule, expect FFXIV to remain one of the top MMORPGs for years to come. Despite a lot of turmoil surrounding CCP in 2014, including layoffs, the departure of well-respected developers and a dropping average concurrent user number, EVE Online continued its steady pace in the Xfire community, losing practically no market share. The drop from the number 4 position to fifth this year is due more to what Square Enix did right than anything CCP did wrong. In June, CCP changed its development cycle from a major release twice a year to 10 releases a year. But will revamps of major systems continue to satisfy existing players at the same time drawing new players in? CCP's strategy is aimed at convincing former players to return while increasing the retention rate of those players who try the game based on the player shenanigans reported in both the gaming and mainstream media. The strategy worked, at least for the Xfire community, in 2014. Will CCP manage to steady the ship in 2015? Aion is the first Korean MMORPG on the list and probably belongs higher on the list. However, I believe that the Xfire community is heavily weighted toward the western audience, so the game actually sits at number 6 in the year end list. However, according to the same report that showed Guild Wars 2's sales declining, Aion, along with Lineage 1, are NCSoft's big money-making games. In the last quarter, Aion's sales were actually 67% greater than Guild Wars 2's. Then again, Lineage 1's sales were double those of Aion, and Lineage 1 has never appeared on The Digital Dozen. Another Korean import, Aion and Tera have always seemed linked together, and not just because NCSoft sued Bulehole for theft of trade secrets. The games finished the year 1 point apart in the final list, as a late rush of Xfire members to Tera in response to the launch of the Fate of Arun expansion fell just short. Tera is the last game on the year end list that appeared every week in The Digital Dozen. The last of the three NCSoft games on the year-end edition of The Digital Dozen, Wildstar was the definition of "the three-month-er". The game appeared 16 weeks, 3 while the game was in beta, and 13 weeks after launch. Or three months. The game was plagued by hacks, bots, and exploits at launch, although not as badly as ArcheAge. High profile developers and community members left ahead of lay-offs and Halloween and Christmas content was scratched as the dev team attempted to fix more pressing issues. In the latest quarter, sales for Wildstar were down 42%. As a sign of the depths the game fell within the Xfire community, of the 31 games that made at least one appearance on The Digital Dozen, Wildstar ranked 27th on Sunday. The Carbine product was far behind games such as the original Guild Wars, The Secret World, Firefall, and Star Trek Online. From the newest to the oldest game on the list, Runescape was the surprise game of 2014. The only browser-based game on the list, Runescape very possibly owes its place on the year-end list due to Jagex' anti-botting and anti-RMT efforts. In addition to anti-bot measures that banned millions of botting accounts, Jagex introduced bonds, a PLEX-type object good for purchasing premium game time and in-game goods. With real players not having to fight the bots, the game apparently became more popular among the Xfire community, appearing for the final 22 weeks of the year. The other big release of 2014 that made the year-end list, ESO, like Wildstar, was plagued by hacks, bots, and exploits at launch. However, at least not as badly as ArcheAge. While the game managed to stay on the Digital Dozen longer than Wildstar, ESO didn't arrive with the big hype train that the Carbine game did. As a result, the game finished in the tenth position. The game has shown flashes of promise, and perhaps a move to a free-to-play or buy-to-play model when the console version of ESO launches will revive interest in the title. The game based on the 4th edition Dungeons & Dragons rules once again managed to make the year-end list. However, Perfect World saw its profits fall in the latest quarter, with management blaming the American operations for the drop. I'm not sure what that means for Neverwinter, although Perfect World is looking to localize the game for the Chinese market. Lord of the Rings Online is the last of the games that has appeared on all three year end lists. The others are World of Warcraft, Guild Wars 2, Star Wars: The Old Republic, EVE Online, and Aion. The game hit a rough patch from March to July, but recovered to appear on The Digital Dozen the final 25 weeks of the year. While the game was scheduled to not receive an expansion in 2014, Turbine did add the Beorning class in Update 15 in November. But with Turbine going through layoffs in October with another round possible in early 2015, the future is looking cloudy. But Turbine did announce in January that they had renewed the license for the IP through the end of 2017. That concludes my look at the top 12 MMORPGs as determined by the Xfire community using the scores from The Digital Dozen for 2014. This also concludes this column. I hope you've found it as interesting to read as I've found it interesting to write. The numbers for Sunday, 29 December, are below. As you can see by the wild percentage changes, the numbers are getting a little too small to reflect reality. So I'll end the series now. I have updated the Google spreadsheet with the last of the information so that you can review the data for all three years here. The end of the year is upon us. Time to once again fulfill the requirement to look back at the year past and fearlessly gaze into the future. That's right, time to see just how badly I did on my predictions for 2014 and make a fool of myself looking ahead to 2015. First, how did I do in 2014? The Subscription Model Is Not Dead Yet - I predicted that both Wildstar and Elder Scrolls Online would remain subscription games until the end of 2014. I was correct on both points. I didn't make the prediction that ESO would make an announcement would go free-to-play in the first half of 2015, which proved that discretion is the better part of valor. I'll come back to this in my predictions for 2015. PLEX-Type Systems Mixed Reception - With as much as I write about RMT, my predictions were spot on, right? Yeah, right. All my predictions were wrong. I predicted that Jagex would announce that bonds would not have the desired effect on RMT within Runescape in 2014. Wrong! And that's a good thing. What about Wildstar's C.R.E.D.D.? I predicted that Carbine would trumpet some success concerning their PLEX-like object. That didn't happen, at least to my knowledge. I also predicted that a MMO in development would would announce it was developing their own version of a subscription plus PLEX model in the last quarter of 2014. I was close, but World of Warcraft doesn't count. Finally, what about my prediction for EVE of a final PLEX price of 660 million ISK? Ha! On Saturday, the average price sold in Jita was 782 million ISK. Unless the prices drops through the floor, I'll count that prediction as a fail. World of Warcraft Does Well, But... - Okay, I got most of my WoW predictions wrong. I predicted that WoW would get back up to the 9 to 10 million subscription mark based on 2.4 million copies of Warlords of Draenor sold in the first week of release. Instead, players flocked back to Azeroth and the expansion sold 3.3 million copies the first day and the number of subscriptions exceeded 10 million for the first time in three years. I did, however, get the major hacking attack in 2014 prediction correct. I'm not even referring to the major DDoS attack that occurred at the launch of Warlords of Draenor. A trojan was released at the beginning of January that allowed hackers to bypass the WoW authenticator. But as far as I know, Blizzard did pretty well the rest of the year, aside from the DDoS attacks that plagued the entire MMORPG industry. Guild Wars 2 Expansion - I got my prediction correct about ArenaNet not publishing an expansion in 2014. However, I failed on the announcement for an expansion for 2015. CCP - Unfortunately, reality was worse for the Icelandic game company than I predicted, and I did not predict a good year. While CCP is a private company and no longer releases subscription numbers, I am going to consider my prediction of a subscription loss in EVE Online in 2014 as coming true. I also predicted that CCP would not release a "Jesus feature" in 2014, and I do not consider Thera to qualify as such. I predicted that DUST 514 would not close in 2014, and at Fanfest that appeared seriously in doubt. I was correct again with the prediction that DUST would not break the 7,000 PCU mark, and the game never came close. I also predicted that CCP would not announce that they planned to migrate the game to the PS4. Correct again. I also predicted layoffs in the Shanghai office. Unfortunately, I got that prediction correct, although just about every CCP office outside Newcastle suffered layoffs in 2014. Finally, my predictions about Valkyrie didn't come true, but not because of CCP. The Oculus Rift was not released to the general public in 2014. I still think that CCP will have Valkyrie ready for release when Oculus Rift is ready for release. Star Citizen - I made three predictions about Star Citizen in 2014, all of which turned out wrong. The first was that Star Citizen would reach the $65 million mark in funds raised from players. That amount was surpassed, with the total as of Sunday at $68.3 million. No major RMT scandal interrupted the cash flow, although stories about Star Citizen's grey market did emerge throughout the year. I also predicted that CIG would announce a release date for the full game for the second half of 2015. Instead, 2016 was announced. Biggest Surprise - My final prediction concerned Landmark. I really thought the game would emerge as the surprise hit of 2014. Although the game, from what I saw from tweeted screenshots from the devs, is beautiful and players in the beta can produce amazing things, the game never took off with the general public. Then again, I expected the game to launch in 2014. Instead, the last patch of the year introduced PvE, turning the game from a strictly building game like Minecraft into a more MMORPG sandbox builder. Perhaps in 2015 Landmark will get some well deserved recognition. I counted 22 predictions in the above, and I only got ten correct. Nostradamus I am not. But that won't stop me from making some predictions for 2015. Here goes. World of Warcraft RMT - One of the biggest stories of 2015 is whether Blizzard carries through with plans to introduce a PLEX-type instrument to the game. I predict that WoW will see PLEX introduced in either Q2 or Q3, and that the price of illicit WoW gold will decline by 25% by the end of the year. As a way to measure the progress, I will track gold prices for the Horde on the Earthen Ring realm. For those unfamiliar with gaming podcasts, that is the home of the Alea Iacta Est guild associated with The Instance podcast. If AIE sounds familar, their EVE offshoot, AIEU, is a member of the Brave Collective. Currently, the low price for 30 thousand gold pieces on Earthen Ring found on Player Auctions is $17.38, with the median price offered at $21.71. I'm predicting that will decrease to $13.04 and $16.28 respectively. Guild Wars 2 Expansion Plans - One would think that after three years, Guild Wars 2 deserves an expansion. However, don't expect one in 2015. However, I don't see how ArenaNet avoids announcing an expansion for the first half of 2016 sometime during the upcoming year. Elder Scrolls Online Goes B2P - I am predicting that Zenimax will announce that ESO will go buy-to-play in 2015. With the game launching on consoles sometime during 2015, I think that Zenimax will want to have the same pricing structure for both PC and console gamers. I don't think that console gamers will accept the subscription model, so I think the PC game will change. I'd suspect the change will occur during Q2. Wildstar Remains A Subscription Game - Perhaps the craziest prediction in this post, but I don't see Wildstar going either free-to-play or buy-to-play in 2015. That would require NCSoft to cough up money for the conversion to begin. While the Aion conversion to F2P went well, NCSoft is the company that cancelled Tabula Rasa after 16 months. Then again, I don't think Wildstar will close its doors due to the news that Giant Interactive plans to publish the game in China in late 2015 or early 2016. I get the feeling that converting the game for the Chinese market will take precedence over doing a F2P conversion for the West. The Western market will probably see the F2P conversion sometime in 2016, so an announcement to F2P is possible sometime in 2015. CCP Stops The Bleeding - I won't predict that CCP will have a banner year, but after 2013-2014, next year will look rather good. On the financial side, players will get their hands on CCP's 2014 financial report and discover that the company did better in the second half of the year than the first. Then, our enterprising players will get their hands on the mid-year report and see that CCP made a profit for the first half of 2015. I also predict that CCP will remain a privately-held company. No IPO in 2015. Next, EVE Online will basically finish 2015 with the same activity levels as 2014. I predict that the average concurrent user mark for the week of the U.S. Thanksgiving holiday in 2015 (23-29 November) will slightly exceed the ACU for this Thanksgiving week. That number, as recorded on EVE-Offline.net, was 25,734. I expect the number to fall between 26,000 and 27,000. EVE may also receive a "Jesus feature" in 2015, depending on the definition of the term. No, not player-built stargates. Look for a shake-up of the incursion system, with Sansha's Nation either partially or totally replaced by Sleepers. On the planetary side of New Eden, DUST will not sunset in 2015. However, expect CCP to announce that Project Legion will launch a beta version with active DUST players receiving invites either in Q4 2015 or Q1 2016. The only prediction I'll make on Valkyrie is that if Oculus Rift is ready for mass sales in 2015 that CCP will have a game to ship along with the VR headset. Expect a Metacritic score of 85, plus or minus 3. One last prediction for CCP. No layoffs. 2015 Will Have Better New Games Than 2014 - At the beginning of 2014, 2015 looked like a quiet year for MMORPG releases. Then ESO, Wildstar, and ArcheAge launched. Now those small little games may outshine this year's big money AAA games. Let me give five games that I believe may break out in 2015. For prediction purposes, these games will all at least hit open beta, if not launch, in 2015. Also for prediction purposes, these are all games that will get good reviews. Landmark - My pick for surprise game of 2014, I really think once this SOE F2P game hits open beta that word of mouth will make the game fairly popular. The game is currently available on Steam Early Access. Shroud of the Avatar - Okay, I'm more of a science fiction guy, but I'm interested in this Richard Garriott effort. But will the game reflect the Ultima Online Richard Garriott or the Tabula Rasa Richard Garriott? I'm predicting the UO version. While I probably won't have time to play, the game is available on Steam Early Access. The Repopulation - Another science fiction sandbox game? The game is available on Steam Early Access and I seriously considered purchasing the game the minute I laid eyes on it. The game is just finishing alpha and I hope it officially launches in 2015, which makes that a prediction made with my heart, not my head. I think that the game will fill a bit of a niche and receive some nice reviews. Skyforge - After Wildstar, I'm not so sure about theme park sci-fi MMORPGs. But I am going to keep my eye on this game. I'll make the prediction the game gets a better Metacritic score than Wildstar. The game currently is not on Steam. H1Z1 - I'm not sure the zombie survival game qualifies as an MMORPG, but I'll predict that when the game finally emerges that critics will compare it favorably to DayZ. While I don't play first person shooters, this is a game I'll follow with interest. Also, I hear SOE plans to make the game available on Steam Early Access in January. That's my list of predictions for 2015. I'm sure someone will point out how crazy I am. Then again, seeing how I did in 2014, my predictions are pretty much wild guesses. With the recent drop in PLEX prices since the release of the latest security dev blog on Friday, I wanted to find out if the change was just seasonal or if other forces are at work. I have information on the PLEX market in The Forge going back to November 2011, so I pulled up the data for the last four years and created a couple of quick tables. First, yesterday's 21 million ISK drop in the average price of PLEX sold on Christmas Day seemed rather steep, but prices were at all time highs. Was the percentage change in line with the last few years? Well, historically, the price of PLEX has dropped, but not quite that much. Yesterday's price decrease was almost double the drop from last year. Next, I wanted to see the change from the 19th, the day CCP published the dev blog, to Christmas. Once again, history shows that prices decline during this period, but even in percentage terms, PLEX prices took a big hit this year compared to the previous three years. Before I run off and start claiming that the security dev blog is responsible for the drop in PLEX, I need to point out what occurred in 2012. In that year, like 2014, PLEX surged to record highs. On 10 October 2012, the average price reached a then record 647.1 million ISK, with some PLEX sold for over 660 million ISK. A bargain today, but at the time the surge in price was so great the EVE Central Bank apparently intervened and the price dropped 11.6%, down to 572 million ISK, only two days later. The market did not bottom out until the average price reached 551 million ISK on 31 December 2012. Over those 11 weeks, the price fell 14.9%. So, was the large drop in the price of PLEX over the past 7 days just a natural reaction caused by the PLEX market declining due to a bubble bursting combined with the Christmas holiday? Or are other forces at work? Personally, I think the bubble burst first, due to the price hitting 1 billion ISK on 19 November 2014 and the inevitable profit taking that ensued, with the price dropping 3.3% from 19 November to 24 November. But I think the bubble burst even harder when six days later, CCP Falcon published the input broadcasting ban. At that point, the market expected demand to dramatically decline with the expected exodus of ISBoxer accounts, and the prices showed. On 25 November, the day that CCP Falcon's post appeared on the EVE Online forums, the average price of PLEX dropped 5.1%, from 945 million ISK down to 896.8 million ISK. The price has fluctuated pretty wildly since 26 November, when the price fell to 878.5 million ISK. Overall, however, the trend continued downward, as from 26 November to 19 December, the price dropped another 3.9%. So anyone betting the market probably foresaw this week's declining PLEX price, just due to historical trends, both seasonal and in reaction to the bubble bursting. But the bubble is bigger this year, with the market falling 19.7% over the past five weeks. So my conclusion? Yes, the prices declined due to seasonal trends. But the decline was greatly exaggerated due to the effects of a bursting market bubble. As for the effects of upcoming enforcement changes? Well, I think they may have played a hand in the market falling as far as it has. With all the things going on, both in the real world and in our virtual worlds, I'm just going to take a break today. May everyone have a merry Christmas today, even if you don't celebrate the holiday. Even the forum warriors. As we get closer to 2015 and the enforcement of the EULA using the terms input automation, input broadcasting, and input multiplexing, I have the feeling we will see a lot of bans of ISBoxer users, not for input broadcasting, but for input automation. "...refers to actions that are commonly also referred to as botting or macroing. This term is used to describe, but is not limited to, the automation of actions which have consequences in the EVE universe." "During discussions about the input multiplexing and broadcasting issue on forums and in tickets, we have noticed a frequent misunderstanding we would like to take this opportunity to address. Any use of macros to interact with the game world is prohibited by EULA now, and has always been." "During discussions about the input multiplexing and broadcasting issue on forums and in tickets, we have noticed a frequent misunderstanding we would like to take this opportunity to address." This sentence, I believe, refers to the back and forth going on between the players who support the stricter enforcement of Section 6A3 of the EULA and those who don't. One of the main arguments of those who oppose the enforcement of the prohibition of input broadcasting claim that the ban will have no practical effect and then go on to describe several workarounds that they believe circumvent the input broadcast ban and are compliant with the EULA. "Any use of macros to interact with the game world is prohibited by EULA now, and has always been." The second sentence, in my view, implies that at least some of the workarounds described are considered macros and are violations of the EULA. Quite frankly, I have not waded through the over 140 pages of the forum thread, so I don't know all of the workarounds listed. But one I do know is ISBoxer's round robin option. Now, I was unsure exactly how round robin in ISBoxer works, so I found a YouTube instruction video filmed by Joe Thaler, the creator of Inner Space and ISBoxer, that explained how the feature works. Starting at the 2:00 mark, and ignoring all references to broadcasting, which is not necessary to use round robin, I took away that round robin performs the following steps. ISBoxer performs an action in the game world. For example, in EVE, the press of the F1 key. ISBoxer performs an action or actions that selects the next client to interact with the next time the hotkey is pressed. He used the word "any", didn't he? Any, in the context that CCP Grimmi used the word, is easily replaced by the word "all". I think ISBoxers are going to get caught because, when I looked at the video, round robin appears to act as a simple hotkey. The focus of the display window never shifted, so the user may not realize that more than one action is performed. But, according to CCP Grimmi's statement, if more than one action is performed, that is activity prohibited by the EULA. I almost feel sorry for ISBoxer users. Almost. But those who use ISBoxer for the windows management and don't try to violate the spirit of the EULA won't run afoul of Team Security. I believe only the users who try to get cute and rules lawyer their way around the ban will wind up with a 30 day ban. Watching the results next month should prove interesting. The rankings of the top twelve MMORPGs as determined by the players of the Xfire community from play on Sunday, 21 December 2014. For more details about the methodology, click here. Historical data can be found here. Sunday saw the Xfire community spend a little extra time playing its favorite MMORPGs compared to the week before. The 3.6% increase in time logged into the games was lead by Final Fantasy XIV (+369 hours) while the gain was partially offset by World of Warcraft (-158 hours). Metin 2 fell back off the list after a one week stay, replaced by Maple Story. Next week is the end. Today's post is the 151st edition of the Digital Dozen. Next week's year end review will be the final post. At the beginning of the year, I decided that if the lowest ranked game on the list didn't have 500 hours played at the end of the year, that I would end the column. Well, often times the 12th place game didn't even attract 200 hours of playtime. This week, only 7 of the 12 games exceeded 500 hours, and this week is a good week. With Xfire moving to concentrate on eSports, I don't have any expectation that the numbers will improve in 2015. Currently, the data provided by Xfire is somewhat useful. I am not convinced that will continue to hold true until the end of 2015. The number of hours recorded by the Xfire community playing the top 12 MMORPGs has declined by 88.3%. Of the games on the latest list, only World of Warcraft would have enough hours played to qualify for placement on the first list. Back in 2012, even the lowest ranked game on the list would have at least 600 people logging in on a Sunday. Now? Sometimes games on the list don't even have 50. The most popular games. Looking back to the first post on 7 February 2012, only three games on that first list appeared in all 151 posts: World of Warcraft, Star Wars: The Old Republic, and EVE Online. Expanding on the concept, the Guild Wars franchise (Guild Wars and Guild Wars 2) also appeared in all 151 posts. Aion came close to matching the achievement, appearing 150 out of 151 weeks. As an honorable mention, Final Fantasy XIV appeared for all 69 weeks since early access opened at the end of August 2013. Unless a company is hit with a DDoS attack, all these games will appear on the final list next week. CCP Grimmi from Team Security posted a dev blog on Friday giving out useful information for EVE Online players heading into 2015. I think a lot of players, especially the space lawyers, aren't really paying attention. Strange, since Team Security plays a major, if not the lead, role in determining what is and is not a bannable offense. So let's step through the dev blog and find out what Team Security has in store for players in 2015 and take a quick look back at some statistics from 2014. Is World Of Warcraft Turning To PLEX? "We’re exploring the possibility of giving players a way to buy tradable game-time tokens for the purpose of exchanging them in-game with other players for gold. Our current thought on this is that it would give players a way to use their surplus gold to cover some of their subscription cost, while giving players who might have less play time an option for acquiring gold from other players through a legit and secure system. A few other online games offer a similar option, and players have suggested that they’d be interested in seeing something along those lines in WoW. We agree it could be a good fit for the game, and we look forward to any feedback you have as we continue to look into this feature." Instituting a PLEX-type payment model potentially could net Activision/Blizzard millions of dollars every year. As an analysis on the Player Auctions website showed last December, the vast majority of RMT sellers look to sell WoW gold. A pretty obvious conclusion considering that no other MMORPG in the western market comes close to WoW's over 10 million subscribers, but the amounts involved are enormous. When looking at sales on the site yesterday, I noticed one seller in a half-day had over 3.5 million gold in sales recorded. The total real cash earned from those sales was in the neighborhood of $2,500 - $3,000. In comparison, sales of EVE Online ISK on Player Auctions typically result in all sellers earning between $10,000 - $12,000 per month. Speculation is that if Blizzard institutes a PLEX system that the move would cripple gold sellers. But would it? Perhaps in the long run. But gold sellers could have lighter wallets very quickly if the EVE experience is any indicator. 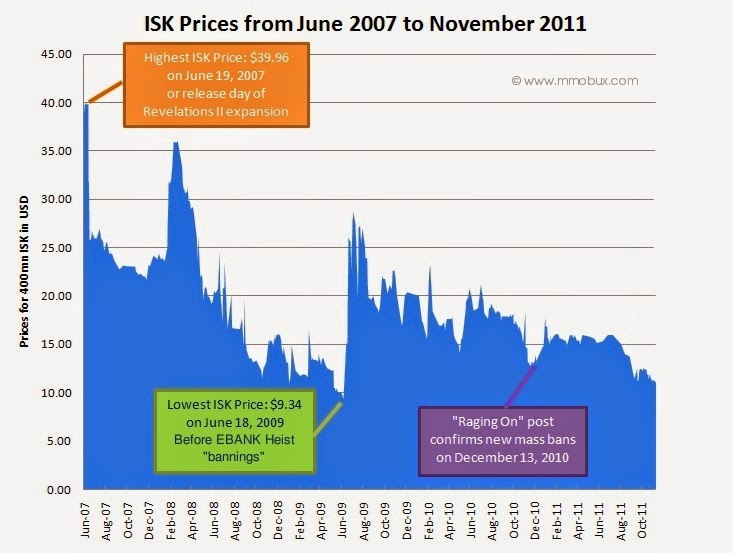 The RMT website MMOBUX performed an analysis on the price of ISK on the secondary RMT market between 2007 and 2011 and found a dramtic drop in the price of ISK associated with CCP allowing the trade of game time codes for ISK on the EVE Online fourms. The price continued to drop until CCP began taking enforcement steps, the most noticeable on MMOBUX's chart Unholy Rage that occurred in June 2009. But CCP continues its War on Bots, ratcheting up the pressure on those engaged in RMT to the extent that currently only of of the sellers listed on MMOBUX as selling ISK offers a price competitive with just going to CCP's website, buying a PLEX, and selling it in Jita, the game's main trade hub. The combination of PLEX driving the price down and Team Security driving the price up through creating a limited supply of ISK eventually made ISK selling unprofitable for most of the websites, although buyers can find ISK to buy in other places. Of course, the price of gold does not have to drop. The experience in Runescape shows that prices actually rose. Over the first 6 months of the existence of Jagex's PLEX-type object, the bond, the price offered by an index of websites I monitored showed that the price of in-game currency rose from $0.41 per million coins to $0.50 per million. 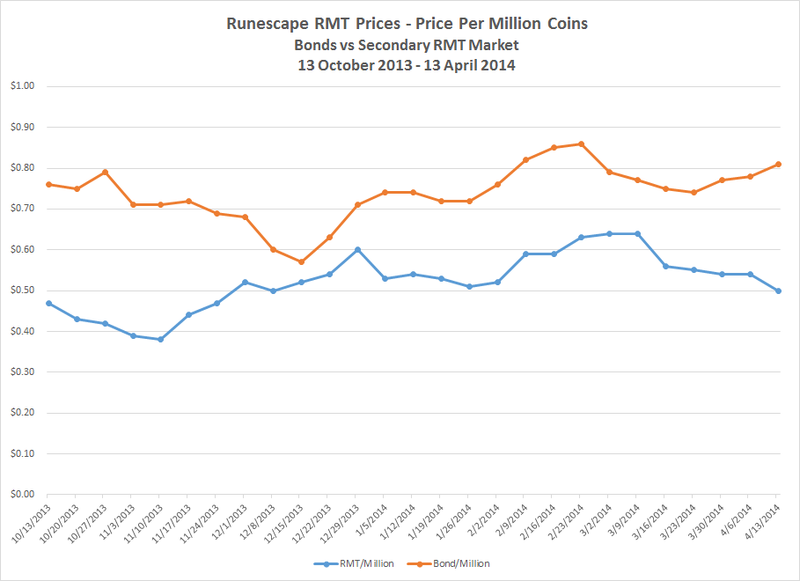 After driving the price down for the first month, the price of Runescape currency rose, both on the bond market and on the secondary market. But the prices on the bond market have decreased, with the price of coins now at $0.62/million coins. The index of websites, on the other hand, are still offering a median price of $0.50/million coins. One big difference between CCP's introduction of PLEX and Jagex's introduction of bonds is enforcement. PLEX were introduced in the Quantum Rise expansion in November 2008 but serious enforcement didn't really begin until the Unholy Rage operation began in June 2009. Jagex, on the other hand, has waged an aggressive, although sometimes ineffective, war against bots and RMT for a long time, famously banning 9.2 million accounts for botting and RMT in 2011. As both CCP and Jagex discovered, just implementing PLEX or just aggressively banning botters doesn't work. Combating the scourge of illicit RMT in MMORPGs requires a coordinated plan that incentivizes players to not go to shady websites while at the same time works to reduce the profits of those engaged in RMT. PLEX is not a quick fix for the problem of illicit RMT. How Blizzard handles the situation in WoW is one of the stories to watch in 2015. Last night after I leveled my Imperial Agent up to level 19 in Star Wars: The Old Republic, I switched over to playing EVE. With the whole controversy concerning input broadcasting, I really haven't felt like playing lately, but I had a plan. I had heard about EVE-O Preview, a windows management program for EVE created by StinkRay that first made its appearance in the EVE Technology Lab section of the official EVE Online forums back in June 2013. After StinkRay unsubbed for awhile, a new thread was created at the beginning of December when Makari Aeron and CCP Foxfour were added to the list of authors. Since the big draw of ISBoxer, apart from its ability to broadcast commands to multiple game clients, is its windows management capabilities, I wanted to find out how the free software worked. So I clicked on the download link and downloaded the application. The download is really quick, as the executable itself is only 205 KB unzipped. So after unzipping the application, I created a shortcut to place on my desktop and started the app up. All that shows up is one window. The boxes checked in the graphic above are what I wound up using. The instructions state that the order in which EVE-O Preview and the EVE clients are opened doesn't matter. I wound up feeling more comfortable opening up EVE-O Preview first. Personal preference. I have three accounts, but usually don't run all three at the same time. I usually dual-box Wandering Rose and Rosewalker, but I figured I needed to throw the third account on just to see what the display would look like. I probably should have undocked my alt and mined in high sec at the same time, but since I never run all three accounts on one machine, I wouldn't know the impact of EVE-O Preview on the performance of my desktop. One thing I was pleasantly surprised at was the ease of setup. I didn't know how to set up the windows, so I went with what I saw Lazarus Telraven use on his Twitch streams for TheMittani.com. I placed the three clients one on top of the other, and then place the three preview windows along the bottom. I decided to get a bit fancy and make the preview window for the active client disappear. All I had to do is check a box. Easy peasy. I decided I didn't like the preview frames, so I unchecked that box. I also liked the little overlay of each character's name so I left that on. Then for the test. I undocked and mined a little bit. As you can see, I used a Procurer to do the mining and a Hound floating in space to provide the extra pilot needed in order to gain leadership bonuses. Also, the Hound is pretty nice to have around when a battleship rat decides to warp into the belt. The third ship on the screen is a Skiff in a station somewhere in high sec. About twice a year or so I run out of low end ores and spend a few hours mining in high sec. But I try not to do it often. I guess if I had really wanted, I could have run courier missions at the same time on that character. I do have to say that switching between clients is easy. Click on the preview window and the proper client appears. I found that making the preview window for the active client disappear not only looked cool but also helped in selecting the proper client with which to interact. At this point I should add I am a clicker. That's right, when I play MMORPGs, I click on the action bars and don't type on the keyboard. In EVE, I'm one of those people who targets using the overview and mouse. Did I mention I love the radial menu? So I really liked having the ability to switch between clients using a mouse click instead of ALT-TAB. After mining one load of glazed hedbergite (4000 units/12,000 m3) and two loads of vitric hedbergite (8000 units/24,000 m3), I then performed one last bit of testing. I shut down the clients and then shut down EVE-O Preview. I then started up EVE-O Preview and logged into all three characters. As I hoped, the position of the clients and the preview windows returned to where I had set them up. If I understand how the software works, the information is stored in XML files in the same directory as the executable. I think the windows position information is also stored on a character basis. But either way, if I wish to use the application again, all I need to do is just start up the clients and go. 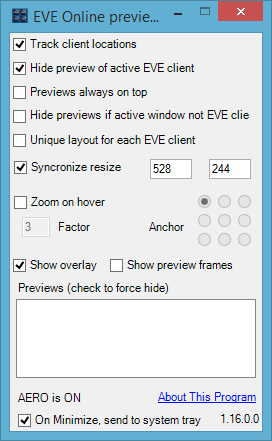 One thing I should add is that EVE-O Preview is strictly, as least in version 1.16, a windows management tool. The application does not have the ability to create hotkeys so users can perform multiple actions with a single keystroke. So unlike ISBoxer, which will allow users to do multiple actions like press F1 and then cycle to the next client, that is not possible in EVE-O Preview. And I hope that ability is never added to the application. I can accept EVE-O Preview in its current state as a windows management tool. I don't want it to evolve into a monster that skirts the edges of the EULA. Will I use EVE-O Preview on a consistent basis? Probably not. I dual box and the two screens provided by my laptop and desktop are a lot easier to read than crowding everything onto a single screen. But I've considered running all three accounts when I run mining missions, and EVE-O Preview would allow me to manage two clients on my desktop pretty easily. Doing those missions in half the time? Pretty tempting. Of course, I'd probably have to abandon my Hound for a Falcon, because I might have one of my ships locked before I can warp off. But everyone loves EWar ships, right? I can't give a final recommendation, because I didn't try to run a real mining fleet. Maybe someone who's used EVE-O Preview for more than 45 minutes can leave a comment about how useful the application is in managing multiple clients. My test really didn't do that. Or perhaps people can try the app out and leave their impressions in the comments. I'm really interested, because I forgot to emphasis the biggest advantage of EVE-O Preview. Using the app is free. That price is a lot better than the $15 USD/90 days or $50 USD/year that Lavish Software charges for Inner Space so players can run ISBoxer. With the beginning of 2015 fast approaching, I find myself spending a little time every day searching for evidence of software multiboxers trying to cash out of EVE Online. The clarification of the EULA (currently found only on the official EVE Online forums) clearly stating that input broadcasting and input multiplexing are bannable offenses will lead to players closing extra accounts or leave the game entirely. Perhaps I'm too cynical, but anytime I see a major rules or game mechanics change, I expect some people to try to exchange their in-game assets for real world cash. Doesn't matter the game or how the players behaved in the game previously. Everyone has a price, and sometimes cashing out is too tempting to pass up. When the threat of an effective sanction passes, some players do shady things. The poster above, Wontolla, is casting a wide net, posting a request on both Dual-Boxing.com and the Zulu Squad fourms, looking for a place to "buy" ISK. 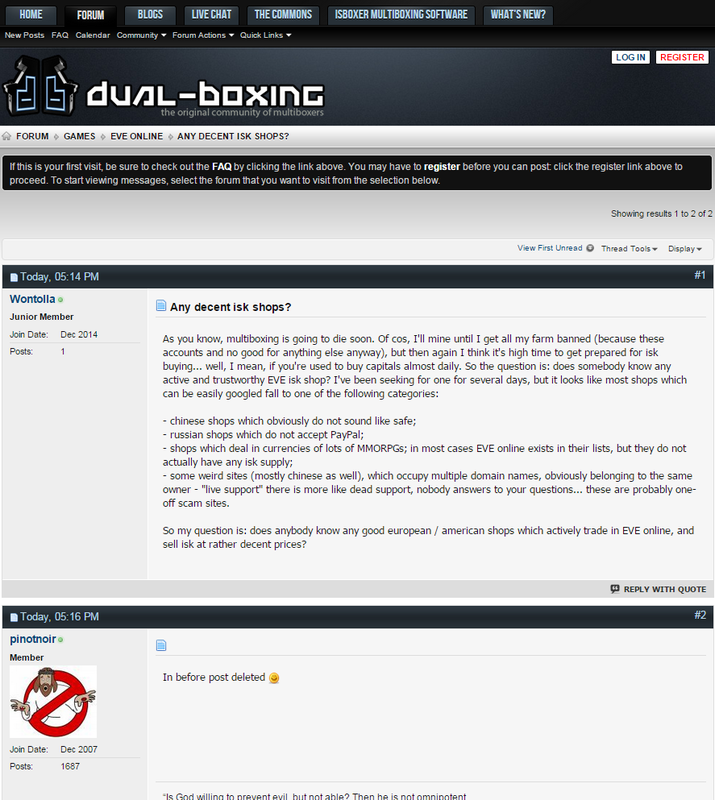 But his real intentions were on full display in his post on the botting/hacking/RMT friendly forums, Public Demands. 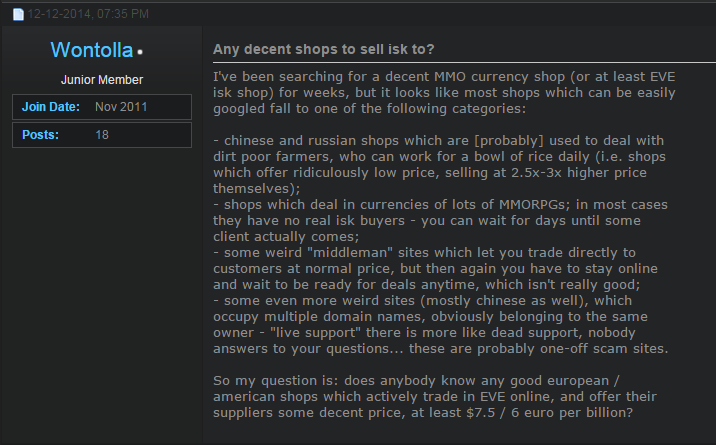 "So my question is: does anybody know any good european / american shops which actively trade in EVE online, and offer their suppliers some decent price, at least $7.5 / 6 euro per billion?" Also, Wontolla is probably a botter, since his first 17 posts on Public Demands all concerned a software called Red Guard, which botters use to disguise their computers from CCP's detection systems, often with hilarious results. Well, hilarious unless you're a Red Guard user. "- some even more weird sites (mostly chinese as well), which occupy multiple domain names, obviously belonging to the same owner - "live support" there is more like dead support, nobody answers to your questions... these are probably one-off scam sites." The recent run-up of the price of PLEX in-game really cut down on the spread companies relying on the buy-sell spread could earn. Even at yesterday's deflated Jita average price of 831 million ISK/PLEX, ISK sellers still are competing with an "official" price of $21.05 USD/billion ISK. I've noticed throughout the year that EVE players don't like receiving at least a $10 USD/billion ISK discount when buying ISK on the secondary RMT market. As of yesterday, the most competitive websites I monitor sell ISK for between $10.95 and $12.99 USD/billion ISK. Really, if a company has to sell ISK at $10.95/billion ISK due to competition with CCP, does anyone really think Joe Botter walking in off the street will receive $7.50/billion ISK for his botted goods? I don't want to leave the impression that I think the crippling of the cottage industry model in EVE means that CCP has won the war against illicit RMT. AsWontolla pointed out, botters and other RMTers can still sell their ISK for full value at "some weird 'middleman' sites which let you trade directly to customers at normal price." The participants at just one such site I monitor off-and-on, Player Auctions, sell between 700 billion and 1.6 trillion ISK per month. And those figures do not include the PLEX that is sold. So botting and illicit RMT are still occurring. However, the effort required, first for the gold/ISK selling sites, and now for the individual player, is getting harder and harder. Just dumping ISK off to an ISK seller doesn't get a lot of money anymore. Trying to get the full value, as Wontolla discovered, "you have to stay online and wait to be ready for deals anytime, which isn't really good." In many cases, the RMT companies are leaving New Eden to concentrate on more profitable games. Now we are seeing evidence that players trying to sell their ISK are having difficulty as well. Perhaps the difficulty will grow to such an extent that players won't bother trying to cash out when they leave the game. I remember when Darius JOHNSON made his first appearance at Fanfest 2011 as CCP Sreegs. He didn't state that his goal was to eliminate botting. The goal he set forth was to make conducting real money trading as painful and as unprofitable as possible. I knew then that he had set a very long path for CCP to follow and I wondered whether CCP would stay the course or start chasing the cheap buck. Three-and-a-half years later, despite hitting a few road bumps, CCP is still making progress. The rankings of the top twelve MMORPGs as determined by the players of the Xfire community from play on Sunday, 14 December 2014. For more details about the methodology, click here. Historical data can be found here. Sunday saw Xfire players spending much less time playing World of Warcraft, which led to a 7.5% reduction in the amount hours the Xfire community spent playing its favorite MMORPGs. The eleven games on the list not made by Activision/Blizzard actually saw an increase of 237 hours played, led by Aion (+117 hours). Need for Speed: World dropped off the list, replaced by Metin 2. Losing Interest. The 12.4% decrease in the time Xfire members spent logged into World of Warcraft is more a function of players just spending less time playing rather than large amounts of players quitting. Sunday's average time of 5.6 hours played per person is the first time the Xfire numbers show the average time dropping under 6 hours since the launch of Warlords of Draenor. Winter Comes Early. Aion led all games with a 117 hour increase in playtime by Xfire members. Aion's winter event, which began on 10 December, runs through Christmas Eve. Fate of Arum. Tera witnessed a surge over the weekend as player began final preparations for the next expansion, Fate of Arun, which launches today. Players experienced "Ultra-Hyper-Fire-Turbo-Time" for six hours each day on Saturday and Sunday, in which they experienced "super-extreme" MP regeneration and all ability cooldowns were reduced by 80%. One of the features that many EVE players looked forward to in Rhea is the new UI. However, some players probably dreaded the day. That's right, botters. When the Unified Inventory system was introduced in Inferno back in 2012, some bots failed to work properly for two weeks after launch. Are we looking at a similar situation today? While CCP Leeloo has not officially launched the campaign season for the next election for the Council of Stellar Management, internet spaceship politicians are throwing their (out-of-game) hats into the ring already. So far, 23 candidates have made announcement posts in the CSM Campaigns section of the official EVE Online forums. For the CSM 9 election held earlier this year I created a page on the blog to give some basic information about the hopefuls running for one of the fourteen slots. This year, I have a Google site, CSM Wire, created especially to display information about the CSM, its members, and elections. I kept the news up to date for about the first month of CSM 9's term, but they just did so much I couldn't keep up. Well, I plan to start supplying the feed again this weekend. I've also created a page with candidate information that I plan to keep up to date. So far, I've pasted the announcement thread of all the candidates plus tried to get the RSS feed of the candidates' EVE-O forum posts to display. "Tried" is the operative word as the site is not entirely reliable. I believe the problem is the feed is timing out. I may wind up also providing the direct link to the RSS page. I know that works as I've tested the link in IE, Firefox, and Chrome. If anyone has any ideas on what I should cover, leave a suggestion in the comments. This year I have a bit of time to prepare something a little more useful than last year. Just don't go overboard, because I still want to play EVE a couple of hours a week. The CSM takes up a lot of time, even if all one does is cover the news. Internet spaceships are serious business. So are pixelated elves and orcs. Perhaps that's why I spend so much time writing about the business side of the MMORPG genre of games. Well, the dark underside of the business, anyway. "You may not use your own or any third-party software, macros or other stored rapid keystrokes or other patterns of play that facilitate acquisition of items, currency, objects, character attributes, rank or status at an accelerated rate when compared with ordinary Game play. You may not rewrite or modify the user interface or otherwise manipulate data in any way to acquire items, currency, objects, character attributes or beneficial actions not actually acquired or achieved in the Game." Some players don't like the fact that CCP finds some of their current activity harmful to the game. Basically, they believe that CCP should balance EVE around the software and hardware they use to play the game. Personally, I'd like to see CCP work towards making the game itself very unfriendly to bots. But EVE was published in 2003 and development began at the end of the 20th century. Such a transformation will take years. But I see CCP making the effort. The CREST APIs and the upcoming removal of the file cache are positive steps in that direction. Death to all market bots. At this point, I don't think that anyone can really argue that input broadcasting is good for EVE Online. Dirk MacGirk's devastating performance on the PraiseBob PodCast answering the best arguments that ShadowandLight and host Angrod Losshelin could muster for two hours I believe ended that debate forever. All that's required now is the mopping up portion of explaining in detail why CCP is clarifying the EULA. Hopefully I'll have a post or two coming out soon on the subject. Writing on the subject is hard as I really need to organize my thoughts and stop chasing squirrels. Trying to get everything stated correctly is pretty important and one of the reasons I try to stick to using the written word. Besides, if anyone wants to hear the arguments I'd make, just turn into EVE Radio and listen to either Dirk MacGirk or DJ Wiggles. They both have the arguments down and, given the braces and rubber bands currently in my mouth, are a lot easier to understand as well. The campaigning for seats on the 10th Council of Stellar Management is now underway, with hopeful candidates already creating posts in the CSM Campaign section of the EVE Online forums. One candidate, Angrod Losshelin, has already caught my eye. Angrod Losshelin is the CEO of Oath of the Forsaken, a wormhole corporation in an alliance called WormHole Occupation and Resource Exploitation, corp ticker . He is also the host of the PraiseBob PodCast. I don't know wormhole politics, but the guy looks like a pretty sound candidate for CSM, right? "I know this is a horrible long shot. However, as I am considering running for CSM based on my alliance's pushing and nagging, I am feeling like we need alot better representation and PR with the rest of the eve community and devs themselves. "My main platform will be wormholes as well as alternative game play styles, multiboxing included. I do not feel I can campaign strickly as a multiboxer, not enough votes, but it is a large focus since I am a multiboxer from various other gaming communities but relatively new to the eve multi boxing front. - Greater respect for the multiboxing community. 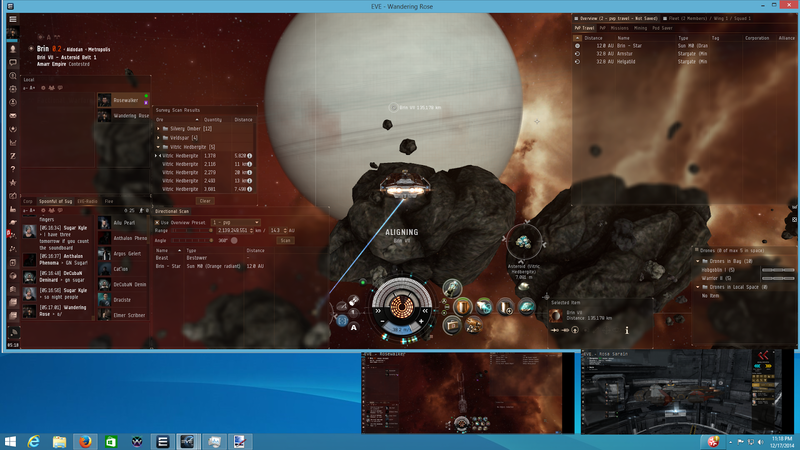 - Better reception of legitimate CCP concerns about multiboxing. - Better static and defined rules in the TOS regarding multi-boxing. "If anyone is willing to help me with this campaign please let me know, I need alot of it. If anyone can get me incontact with CEO's of multi-boxing friendly corporations and alliances please also let me know. "IGN: Angrod Losshelin - Host of Praise the Bob podcast and CEO of Oath of the Forsaken"
"Edit: a clarification for those trying to walk the line between multiboxing and input duplication. I realize ccp is banning input duplication, but I think that the other capabilities of isboxer and similar software, as soon as the mob gets worked up over it, will ensure that owning 2 accounts is 'unfair'. The main purpose of isboxer is input duplication, allowing you to control multiple accounts as if one person. Removing that feature is a huge blow and on the path to a complete removal of management of alts with any efficiency." "You know, and I'm cop to it right now. I have botted games before. I've never botted EVE and I've never botted World of Warcraft, specifically, are the two I've never botted. But I enjoy botting. Games such as, you know, Everquest 2, I bot all the time there. So, you know, Sony, you can ban me if you find my accounts. Different games like RIFT; I've botted RIFT before. I find it almost more of a challenge once I've reached max level to bot and accomplish things automatically that it would take someone who's doing it by themselves a lot longer. Now, EVE Radio personality and occasional TMC contributor Dirk MacGirk, who appeared on the podcast to argue for why banning input broadcasting/multiplexing was a good idea, right before the above quote had just finished arguing that ISBoxer was not botting software. Why Angrod decided to make the comment about botting, I have no idea. Dirk, to his credit, tried to steer the conversation back toward the main issue: input replication. However, Angrod, possibly realizing he'd put his foot in his mouth, had a few more things to say about botting in EVE. As I mentioned before, I believe this last paragraph was to cover up his indiscretion of revealing his true feelings about botting. He doesn't refrain from botting because he thinks botting is wrong. He doesn't bot because he makes more ISK multiboxing using ISBoxer. Then again, that is possibly true because he couldn't figure out how to bot himself. He did give CCP credit for making developing a bot difficult, which suggests he at least tried to develop his own bot. From my reading and listening of that section of the podcast, he doesn't bot due to lack of skill, not because he thinks botting is wrong. In fact, he admits to botting in other games, mentioning EQ2 and RIFT by name. Let's recall, Angrod is a pretty non-repentant botter where EQ2 is concerned, challenging SOE to ban his account if they can find it. I guess Angrod doesn't know about all the SOE employees who play EVE. In fact, I know that SOE CEO John Smedley used to fly with EVE University, the CFC, and probably TEST. As of Fanfest in May, I heard that he still occasionally logged into his EVE account and was rumored to have considered attending the event. Oh, and I get the impression that Smedley and Hilmar get along pretty well. Good thing Angrod is living in a wormhole. In the interest of full disclosure, I should add that I played EQ2 for almost 3 1/2 years. During that time I leveled 9 crafting characters, one in each crafting class, to the then level cap of 80. To say that I don't like EQ2 botters is an understatement. One day I may even write a post about how botters and hackers in EQ2 fueled the fire that led to the anti-botting posts I'm semi-famous for in EVE. So to say I may have a bias against a proud EQ2 botter is a pretty good guess. Setting my bias aside, once word of Angrod's botting history circulates among the ISBoxer community, I don't see how Angrod gets any significant support. Users of ISBoxer are trying to prove they wish to follow the rules. Backing a proud botter like Angrod seems counterproductive. Then again, maybe ISBoxer users really don't see anything wrong with botting after all. I don't think that's true of the vast majority of ISBoxer users, but I'm not infallible. Needless to say, I am recommending that players do not cast any votes for Angrod Losshelin. I oppose botting and can't see how putting a botting supporter, even if he doesn't bot in EVE, on the CSM can do any good. Why Change Key Rebroadcasting In EVE Online?